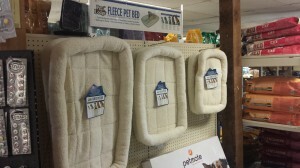 Mansfield Feed Mill carries fleece pet beds from Pet Lodge. These beds provide comfort for your dog in all seasons. This fleece pet bed is ideal for use in crates, dog houses, vehicles or on the floor. These are cushioned with polyester-filled base and bolster. They are machine washable and able to be rolled up and taken anywhere. This fleece pet bed is designed to keep your pet cool in the summer and warm in the winter. Dogs love these beds and owner’s love how easy they are to throw in the washer! Keep your pet comfortable this winter with a new fleece pet bed! This entry was posted on Saturday, December 10th, 2016 at 10:00 am	and is filed under Articles, Dog, News & Updates. You can follow any responses to this entry through the RSS 2.0 feed. Both comments and pings are currently closed.